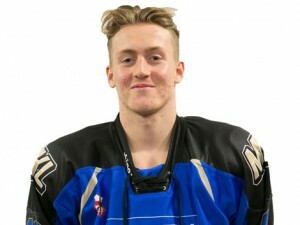 Invicta Dynamos Head Coach Kevin Parrish has today added goals, assists and a hefty physical presence to his forward options with the capture of former Elite League and EPL Brit forward Bobby Chamberlain. At 22 years of age Hull born Bobby Chamberlain has already made over a hundred appearances at the top tier of British hockey, a further hundred in the EPL and featured on the international stage for Great Britain at under 18s and under 20s level. His hockey journey began at home in Kingston before a year across the pond featuring in the Ontario East Minor Hockey League (OEMHL) at AAA standard in 2010/11. On his return to the UK he was snapped up by the Hull Stingrays where he then dressed 51 times in his debut Elite League campaign before another term the other side of the Atlantic in the Western States Hockey League (WSHL) the season after. In 2013/14 Chamberlain returned to Hull and dressed for a further 48 Elite League fixtures before switching to the Manchester Phoenix of the EPL the following year. Here he made his mark with 12 goals and 13 assists for 25 points whilst also tallying 54 minutes of penalties in 46 league outings. Having found his feet in the division he enjoyed an even better return in 2015/16 – this time notching 43 points for the Milton Keynes Lightning having found twine on 18 occasions and played a role in 25 more during 53 fixtures. Cementing his reputation as a forward not shy of adopting the physical side of the game the agitator also clocked up 96 minutes of penalties. 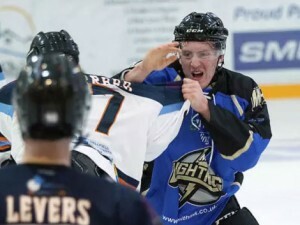 By 2016/17 Chamberlain had become a firm favourite with the Lightning faithful and he was swiftly re-signed in the summer and awarded the ‘A’ of alternate captain. He would feature 27 times in that role and scored 15 goals whilst adding 11 assists for 26 points before a serious injury halted his campaign. A disagreement with his club then saw him part ways with Milton Keynes setting up a switch to the NIHL South Division 1 and the Invicta Dynamos this off-season. Speaking on the capture of his first new face of the summer Head Coach Kevin Parrish said, “Bobby Chamberlain is a big, big signing for us and I’m delighted he has agreed to join us at the Dynamos for 2017/18. He moves to Kent bringing with him experience in the EPL and Elite League and arrives with a reputation of a powerful forward who finds the net, creates chances and makes his presence felt. He was hugely popular in Milton Keynes for his all-round displays and his willingness to drop the gloves to defend his teammates so I’ve no doubt the fans will take an instant liking to him in Gillingham”. Meanwhile new signing Bobby Chamberlain was equally pleased to have completed the move and said, “Having spoken to Kevin Parrish for the last few weeks I really liked what he was looking to do with the club next season and I knew I wanted to be a part of it”. Asked what he would be hoping to bring to Kent he added, “I’ll be looking to bring a bit of leadership as I pride myself on being one of the voices in the changing room. I’ll add a physical edge but also look to contribute by doing my share of putting the puck in the net. I’ve always enjoyed playing in the big games and I’m looking forward to doing that in a Mos jersey. I’m really excited for the new challenge and I’m more motivated than ever for the new start”. 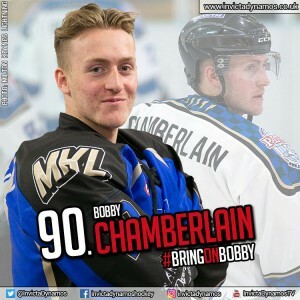 Bobby Chamberlain will wear the number 90 for the Dynamos and becomes the club’s fourth player announced this off-season ahead of the restart in September. Warm-up Jersey – For just £125 get your name or logo printed on the back of Bobby Chamberlain’s warm-up jersey. Sponsors are also named on our website and in our match day programme and then presented with the jersey to keep at the end of the season. Game jerseys – For just £250 for individuals / £300 for businesses get your name or logo on the back of Bobby Chamberlain’s game jerseys. Sponsors are also named on our website and in our match day programme, are announced over the loudspeaker during player introductions at every home game, receive a programme advert (business sponsors only) and are presented with the jersey of their choice at the end of the season.